Click on questions to reveal the answers. Where can I get a Show-Me National Parks Passport for Missouri booklet? You can pick up a Passport booklet at any of the Missouri national parks’ 8 Visitor Centers. See each park’s page for the location of the visitor center. 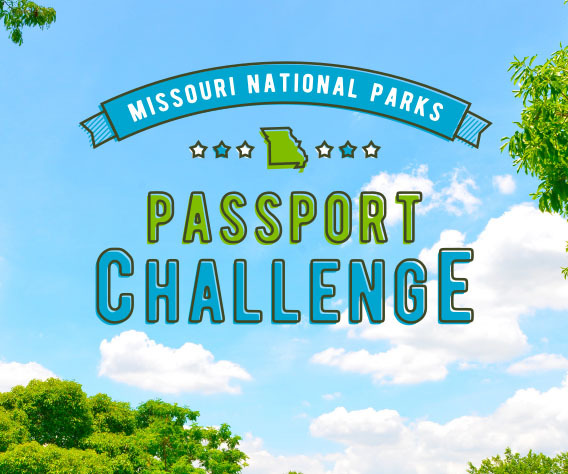 While you're visiting any Missouri national park, get a park-specific stamp at the Passport Challenge stamping station in the visitor center. Please note that to be eligible for the Grand Prize, you must register your Passport online. Passports are free. Some parks charge an entry fee to enter the park, but there is no fee to access the stamping station in the visitor centers. How many parks do I need to visit to get a prize? If you visit 3 of Missouri's national parks, you'll receive a commemorative water bottle. And if you visit all 6 you'll receive a drawstring backpack commemorating your achievement. Be sure to have a ranger verify your stamps and sign your Passport to collect your reward. Multiple members of my family would like to participate. Are we all eligible to earn prizes? Yes, up to 4 people per household can receive prizes and be eligible for the Grand Prize drawing. Each person must have their own email address and their own Passport. See the Passport rules. The Passport Challenge runs from August 27, 2016 through December 31, 2017.